Based on the same idea as my “cache clearing script“Â (but 10x better),Â Magento now includes some handy scripts to clean the log tables, to compile source files and to rebuild indexes. 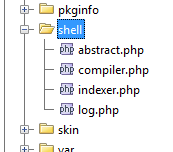 For people withÂ very large databases (10k+ products) this is sometimes the only way to actually accomplishÂ something without running out of memory or exceeding execution time limits.Â The scripts are located in the /shell folder. These scripts are made to be run manually by logging on the server with SSH or they may also be setup to be executed periodically as a cron job. --mode-realtime <indexer>  Set index mode type "Update on Save"
--mode-manual <indexer>    Set index mode type "Manual Update"
Thanks I was finally able to clean my cache, having 30k+ products means its impossible to use the backend to refresh the cache without timeout.